Red Tails tells the true story of the Tuskegee Airmen, an all African-American unit that served as pilots in World War II in Italy in a time when many Americans believed that African-Americans were not "mentally and physically able" to serve. The Airmen not only proved that they were able, but in fact quite adept, and their story is one that has never been told on the big screen until now. The pilots and their commanders include Major Stance (Cuba Gooding Jr., The Hit List), Colonel Bullard (Terrance Howard, The Ledge), "Easy" (Nate Parker, The Secret Life of Bees), "Junior" (Tristan Wilds, TV's 90210), "Joker" (Elijah Kelley, Hairspray), "Smoky" (singer Ne-Yo), Joe "Lightning" Little (David Oyelowo, The Help), and others. Some of the boys had their own side plots as well; Joe Little was dating a local Italian woman (Daniela Ruah, TV's NCIS: Los Angeles), even though he couldn't speak Italian, and Major Stance was fighting for the Airmen's right to serve in the war, as there were still a lot of racists around who didn't the idea of African-American pilots. Because of Stance and their natural talents, the Red Tails soon get a major opportunity - escorting bomber planes into Berlin - and they take advantage of it to show their flying abilities. 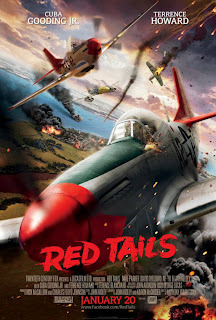 Red Tails is in theaters now and is rated PG-13 with a runtime of 125 minutes. 3 stars out of 5.